Some of you may recall the 30 x 30 misnomer that we fessed up to a few weeks back. 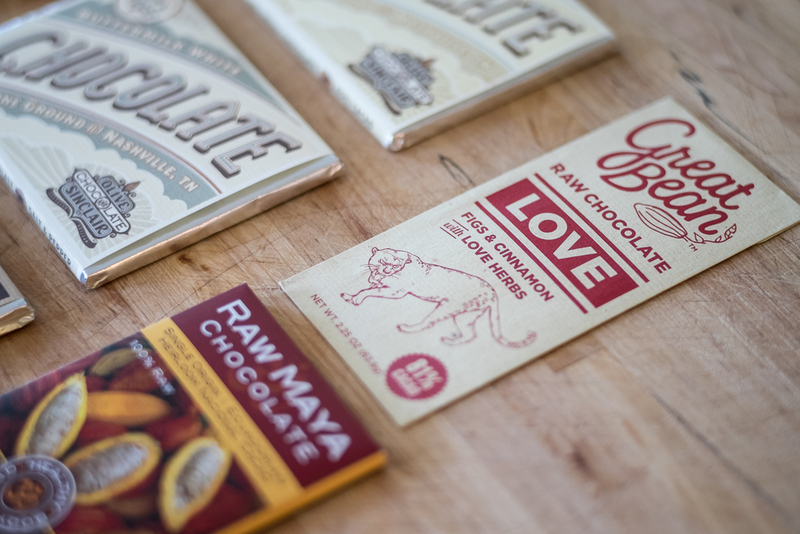 Well, I'm hoping that just as you granted us that small admission, you'll indulge us for blog #29 — Cacao. Oddly enough, the trajectory of this trip just happened to follow along a path of some of America's top small batch, bean to bar artisan chocolate makers. Imagine that? With a little planning, we were able to visit five shops / small factories in all — three of which we were able to tour. Yum-o! Warning: Below is a very short list of the makers pictured in the photo above. Should you get sucked into this world, be prepared to spend an inordinate amount of your food budget on these decadent creations. * Also pictured: Sea Salt & Vinegar and Duck Fat Caramels. Yeah, you read that right. For a more comprehensive list visit this devotee. And, finally, our apologies to the other, sacrificial bars that were devoured along the road. While you were unable to make it to the final photo shoot — be proud — you were delicious just the same. Cheers y'all, now go eat you some chocolatey goodness in celebration of International Chocolate Day!